Honey bees are in big trouble these days and we're all about spreading the word to help save our buzzing little buddies! Colony Collapse Disorder, the sudden disappearance and die-off of bees, is a critical environmental issue because bees play such a crucial role in our ecosystem. It's been said that we have bees to thank for one in three bites of food we eat! We adore this print by Hannah Rosengren. 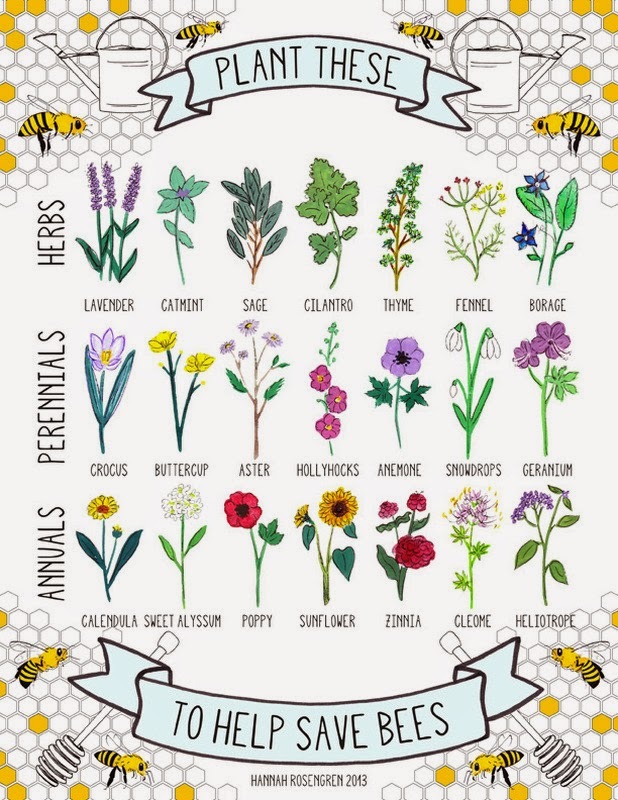 Its a beautiful reminder of the herbs and flowers we can plant in our gardens (or in pots on our porches or windowsills) that feed bees and in turn promote pollination and the livelihood of bees and other pollinators. Besides planting bee friendly gardens, there are plenty of super simple things we can do to help: Buy local honey. Stop using commercial pesticides, herbicides, and fertilizers. Buy organic (and thusly pesticide-free) food. Head over here if you're interested in more information. And check out other lovely prints by Hannah here! Perfect post. I have been trying to plant things to attract bees myself. Most people just don't understand how important they are! This is going to be a perfect addition to my classroom in August! Young ones are pretty much taught that bees are just an evil stinging insect, but not my class! This would look awesome in a classroom. Great idea Kelly! I love this post! I'm all about honeybees so this is great! And that print... perfect!! Thanks for sharing!